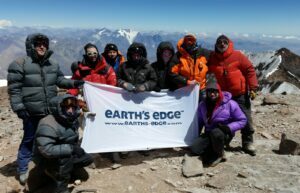 Come along on Wednesday the 17th to hear Earth’s Edge talking about their upcoming trips to Aconcagua. Read below for more info on this exciting expedition. 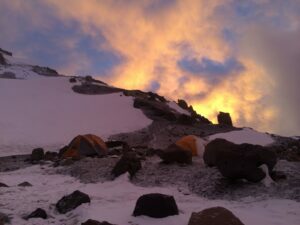 Our Aconcagua climb takes you to this towering peak of 6,962m at the heart of the Andes. Aconcagua is the highest mountain in both the Western and Southern hemispheres. The exact origin of it’s name is unknown, however the Inca word ‘Acon Cahuk’ translates to ‘Stone Sentinel’ which is befitting of this giant peak. Although Aconcagua is considered a trekking peak and no technical mountaineering is required to reach it’s summit, it is far from easy. The complexities of proper acclimatisation, high winds, extreme cold and a long summit day make climbing Aconcagua a formidable challenge. Our 22 day itinerary allows for proper acclimatisation and has the flexibility to accommodate bad weather, maximising your chances of reaching the summit. There is much debate over which route is best to take to the summit. Our approach through the Vacas valley and descent along the ‘normal route’ offers the best of both routes. The trail through the Vacas valley is slightly longer but is much better for acclimatisation as it ascends more gradually. It is also more beautiful and less travelled than the normal route. From Plaza Argentina base camp we combine the Polish route, the Ameghino traverse, Upper Guanaco and the ‘normal route’ giving you the best possible experience of Aconcagua. The entire route is stunningly beautiful, with the views from Camp two and three simply breath-taking. The area also has some amazing wildlife with puma, condor, mora eagle and a wild variety of other bird life found in Mt Aconcagua Provincial Park. We fly in and out of the beautiful city of Mendoza, home of Argentina’s famous malbec grapes and some amazing cuisine.